I heard a small boy tell his mother how he thought ‘the wall’ was in China. He was right of course. If only partially so. The boy’s confusion is telling of how puzzling grand scale remembrance celebrations adults organize around certain historical events can be for young minds. And right now, the confusion risks to be considerable. This year, the celebration of the fall of the Berlin Wall coincides with the First World War Centenary Commemorations. Walls and wars, names and battles, dates and places. Wreaths and seas of poppies, the construction of new memorials, 8000 illuminated white helium balloons aligning the streets before lifting up in the sky. It is not so much the scale of this year’s war remembrance as the diversity of its related and peripheral events and newsreels that has made this commemoration exceptional. On home soil, the First World War has come to life through the efforts of almost every city along its front line to tell its story. Anecdotes of daily life during the German occupation, stories of hunger, of fear and resourcefulness, alongside accounts of the chaos and turmoil of often forgotten battles. But this year’s commemoration has also allowed us to learn of the plight of those further afield. The First World War as it was experienced and fought in Africa, in the Middle East, the Far East. Thus it has been a year to remember the true meaning of the ‘World’ in ‘World War’. For it is tempting for Europeans, especially after the EU having received a Nobel Price, to reinterpret the First World War merely in the light of its current principles of European integration, nobly accentuated with values of cooperation, peace and human rights. After all, The Great War was followed by a Second World War. The height of the celebrations on the 11th of November will see the inauguration of the Ring of Memory on the hill of Lorette, carrying 580 000 alphabetized names of soldiers who died in this region between the summer of 1914 and 11 November 1918. Yet still there seem to be no signs of commemoration fatigue. On the contrary. The number of visitors of the 2,400 British First World War cemeteries in France and Belgium has continued to rise. A decade ago, 200 000 people visited Tyne Cot, the largest British Great World cemetery at Passchendaele in Belgium. Last year there were about 300,000 visitors. This year the total visitors will reach 460,000. The number of visitors at the Tower of London’s Blood Swept Lands and Seas of Red, would, by the 11th have exceeded 4 million and will now be extended until the end of the month. There are various ways the world commemorates and remembers. Heads of State and dignitaries perform solemn celebrations while we, the common people, go on day trips to visit historical sites, museums and exhibitions, often with our families, trying to get our children involved. Amidst the myriad of commemorations, be they called magnificent, repetitive, surprising, banal; be they accused of a lack of originality or, worse, ‘over-touristification’, I was reminded of the two statues of a father and a mother, The Grieving Parents, Trauerndes Elternpaar, sculpted by Käthe Kollwitz as a tribute to her youngest son who was killed in October 1914. 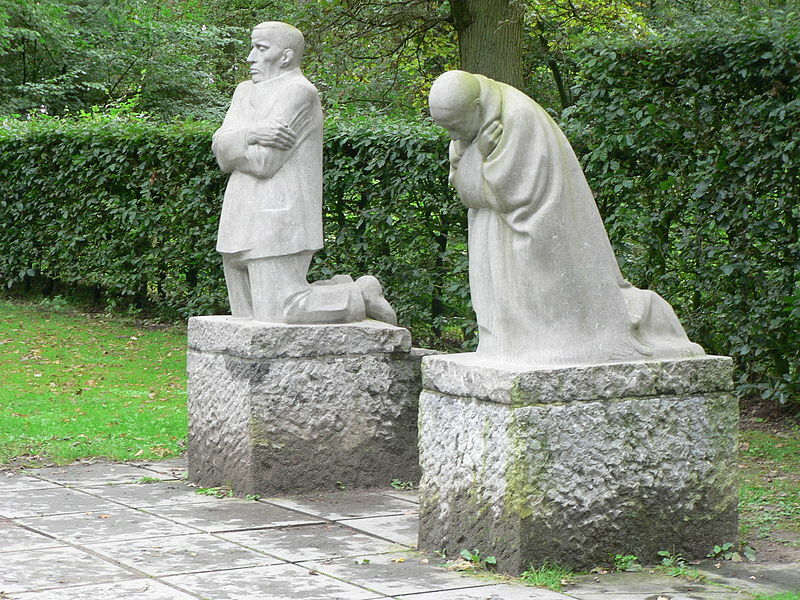 The statues, now in the Vladslo German War Cemetery, do not need words. They do not need a date or the name of a war. They do not need two minutes of silence. They stand grey and stark. Lonely. They are the images of grief, the real heart of the commemoration. Posted on 10 November 2014 18 November 2014 by MrsCalvo	This entry was posted in Popular Culture and Entertainment and tagged Belgium, celebrations, commemoration, historical events, The Great War, Tower of London. Bookmark the permalink.